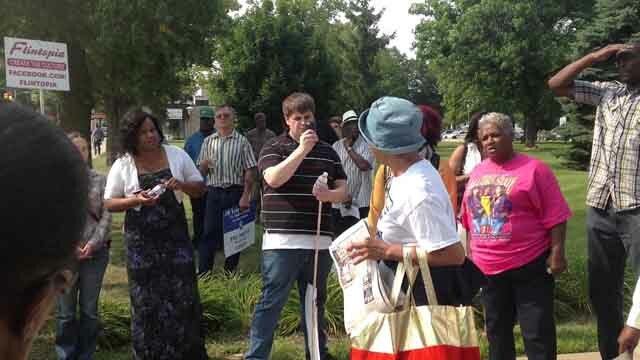 Claire McClinton Speaking after the Water March on August, 10, 2014. What do excessive testing in schools, the situation in Ferguson, Missouri, speed cameras, and the recent lead poisoning in Flint, Michigan, all have in common? They’re all symptoms of a new America. An America that is no longer a democracy. An America that is under the control of corporate special interest groups like the U.S. Chamber of Commerce. And an America that is being micromanaged by a mid-level tier of bought-and-paid for politicians who no longer work in the interests of the public. The media keeps presenting these crises as one-off events, singularities. If you take a step back though, there are clearly common threads. The first thread is that corporate special interests keep buying themselves out of responsibility (privatize the profit, socialize the risk). The second is that in order to keep people in check and execute on these plans, increasingly they’re relying on a tier of mid-level micromanagers. The poisoning of Flint is just the latest symptom of a country that seems to be more and more under corporate special interest micromanagement. Increasingly, politicians fall more into the role of “managing” citizens rather than serving them. 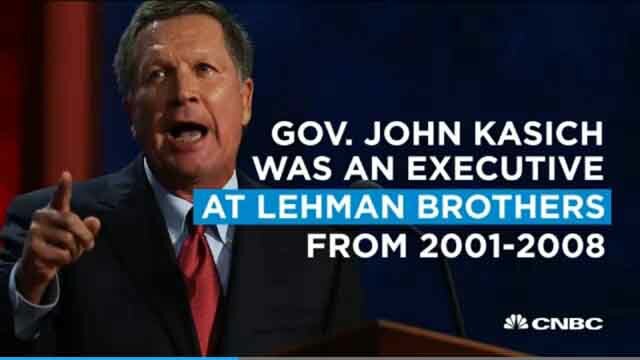 Screenshot from “10 questions with John Kasich” interview on CNBC in July, 2015. Republican John Kasich, who worked for Lehman Brothers, is the perfect example of this new breed of micromanagers. They often even bill themselves as “CEOs.” They’re not CEOs. They don’t typically have any vision for how to build a better community. They’re mid-level “yes men” who typically do what the national or regional Chamber of Commerce want. You’ll find these mid-level managers in the Democratic Party too. A few prominent examples are Rahm Emanuel (mayor of Chicago) and Andrew Cuomo (governor of New York). The problem isn’t government. The problem is that government isn’t working for people. Across the country local community budgets and school district budgets are being slashed at the state level. State budgets are being hurt by automatic cuts to the federal budget. All of these cuts have big consequences to cities and municipalities. One of Rick Snyder’s first acts as Michigan governor in 2011 was to sign a series of tax cuts for large corporations. In addition, Snyder shifted the burdenonto people by eliminating tax cuts for individuals and by cutting budgets at the local and community level. The net of this is that Michigan still faced a deficit, as revenue and jobs didn’t grow as projected. Flint switched water supplies to try and save money. This, in and of itself, isn’t necessarily a bad thing. The problem came when residents started complaining that the water supply was bad. Saving money trumped everything and officials stonewalled for 18 months as residents were poisoned by lead. Meanwhile, when General Motors complained about the water supply, Gov. 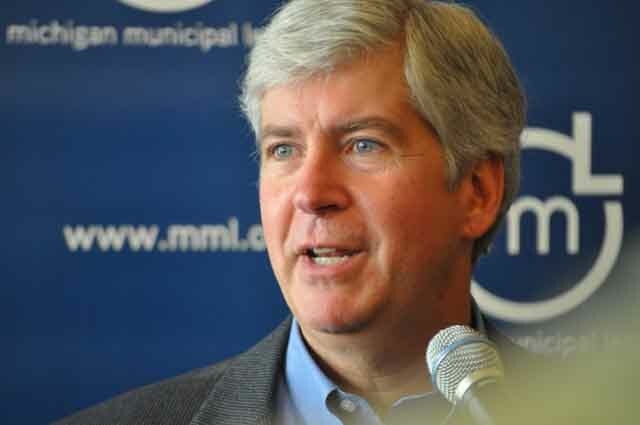 Snyder immediately spent $440,000 to hook GM back up to the Lake Huron water supply. 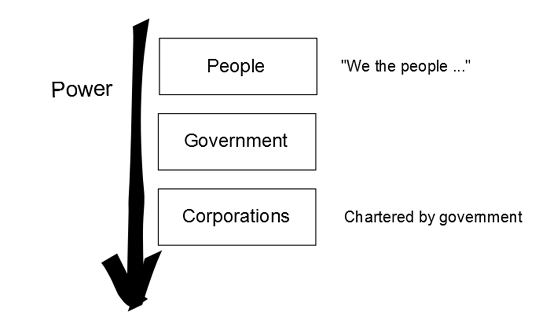 Ideally, the way both government and our corporate structure should work is that it should work for the public good. It is common for micromanagers, especially those who exhibit narcissistic tendencies and/or micromanage deliberately and for strategic reasons, to delegate work to subordinates and then micromanage those subordinates’ performance, enabling the micromanagers in question to both take credit for positive results and shift the blame for negative results to their subordinates. These micromanagers thereby delegate accountability for failure but not the authority to take alternative actions that would have led to success or at least to the mitigation of that failure. This is why no one wants to work for micromanagers. In Flint, corporate media is working overtime to throw low-level officials under the bus for Snyder’s budget cuts. Darnell Earley, first emergency manager of Flint, when he was Saginaw City Manager (Michigan Municipal League/Flickr). First, they’re claiming the city is in trouble because it’s been run in the past by the Democratic Party. Curiously, they never talk about the automotive industry leaving Flint. Second, they’re saying Snyder’s “emergency manager” was a Democrat. 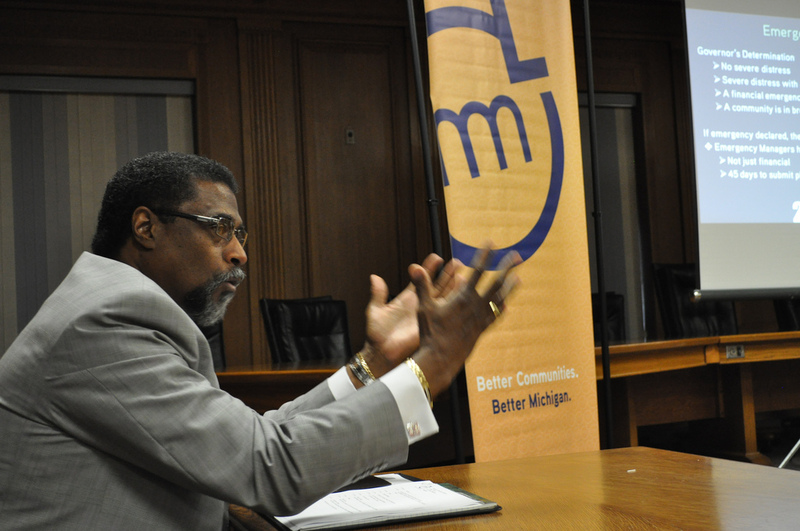 True, a Democrat hand-picked by Snyder to enact Snyder’s plan to remake the city under emergency management. This version of the story leaves outSnyder’s plan to eliminate democracy and put Flint under emergency management. It leaves out any mention of the real problem. The real problem is not that the city tried to save money: It’s that when the plan didn’t work, they stonewalled and continued to poison the city for over a year instead of fixing the problem. The auto industry has a history of weighing the costs of whether it’s cheaper to spend the money to fix the defect in millions of cars or to simply pay off a bunch of lawsuits filed by the victims surviving family members. Does a cynical, arrogant culture like this make it easy for a former corporate CEO, now Governor, to turn a blind eye to the lead that is discovered in a municipality’s drinking water? Not only that, but when Michigan residents overturned Gov. Snyder’s emergency manager law, Snyder and his “yes men” in the Michigan legislature simply ignored Michigan’s citizens and passed a new one. Micromanagers tend to run things through force, intimidation, and fear. The most common way to do this is to set up a bunch of rules that can be arbitrarily enforced on anyone. That is, establish a rule that everyone breaks. Then arbitrarily enforce it on people you dislike, and don’t enforce it on the people you do like. Overall, we found that by disproportionately stopping, charging and fining the poor and minorities, by closing the Courts to the public, and by incarcerating people for the failure to pay fines, these policies unintentionally push the poor further into poverty, prevent the homeless from accessing the housing, treatment, and jobs they so desperately need to regain stability in their lives, and violate the Constitution. 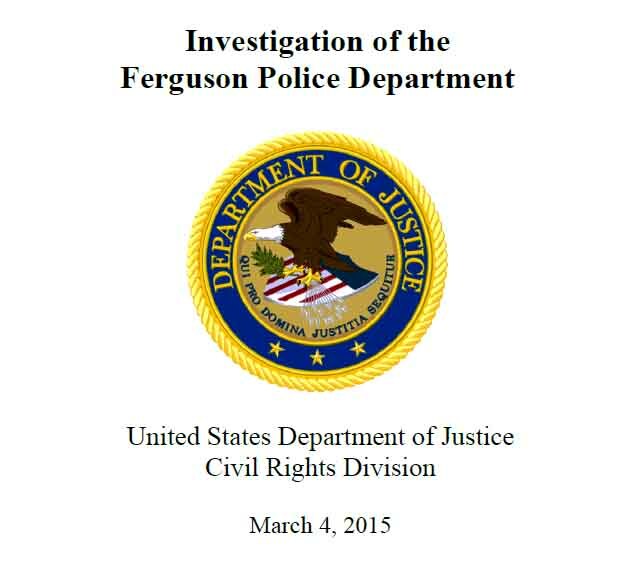 U.S. Justice Department report on the Ferguson police department. 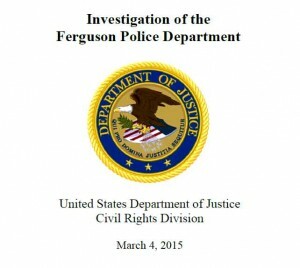 The Justice Department found similar in their investigation of the Ferguson Police Department. Some of the towns in St. Louis County can derive 40 percent or more of their annual revenue from petty fines and subsequent court fees. Nicole Bolden, a resident of Ferguson, was charged $1,700 in court fees for failing to appear in court for traffic violations. This isn’t true only in predominantly black communities like Ferguson, though. It’s happening everywhere to some extent or other as a result of budget cuts. Some municipalities have resorted to privatization and new taxes and fees in order to save money and generate more revenue. As a result, residents are being forced to pay more for services like trash collection, sewage, public property maintenance, parking meters, and to pay new taxes on a variety of everyday goods. These policies are regressive because they hit low income people the hardest. 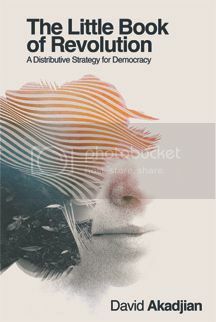 The idea behind corporations initially was that, in exchange for the ability to create a profit and limited liability, they would serve the public good. Under micromanagement, corporations and their micromanagers in government are resorting to using the people as an additional source of revenue. If you object to this, the micromanagers shut down a critical connecting bridge to your city or hold your budget hostage. The problem is that government is not acting by and for the people. The problem is that people are being micromanaged. 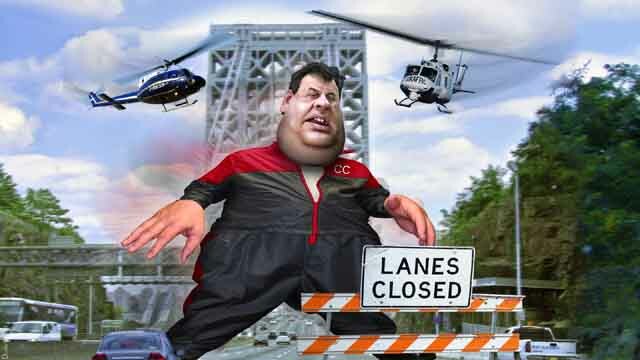 Chris Christie, by the way, just sold off New Jersey’s water supply as he’s getting ready to leave office. What could go wrong though? We don’t need an EPA. Markets “regulate themselves,” right? As our nation faces huge economic issues of outsourcing, globalization, and technology, and we try to keep up in education, one of the biggest “solutions” offered by educators is school tests. Instead of talking to educators and looking at schools that work, many states have been mandating testing. Nearly half of Pearson’s $8 billion in annual sales comes from America, where state school systems have been implementing extensive testing as a result of No Child Left Behind. This happens even though the company hasn’t been able to demonstrate any academic improvement. The policies that Pearson is benefiting from may be wrongheaded in a million ways, but it strikes me as deeply unfair to blame Pearson for them. When the federal government starts doing things like requiring all states to test all kids, there’s going to be gold in those hills. The people we’ve elected have created a landscape that’s allowed Pearson to prosper. In Ohio, kids don’t even receive results of statewide PARCC tests until nearly a year later. “What’s the point of having any of this data?” asked State Representative Andrew Brenner, chairman of the House Education Committee. The point is that the data has little to do with education and everything to do with micromanagement of the schools by politicians. If we hope to change things, we need, as Bernie Sanders says, a political revolution. We need to remember what we are as a country and restore democracy. Unfortunately what’s happened is that we’ve fallen victim to this idea that the micromanagement of America is somehow a good thing. We’ve bought into a lot of fear, and the idea that somehow what our country really needs is more management. But this isn’t the case. What our country needs is more democracy. People know what’s in their best interests. When they have a voice in our cities, states, and country, we tend to do pretty well. We build things that are for the benefit of everyone (not just a few). Unfortunately, our national goal right now seems to be putting in place a system for micromanagement in order for a few to reap extreme profits. With this as our national goal, we will see more Flints and more Fergusons. It will also not stop at poor urban areas. Current micromanagers simply target these areas first because they’re the easiest. It is expanding and will continue to expand unless fundamental change occurs. This is why the campaigns of Donald Trump and Bernie Sanders are so popular: Because people realize something is fundamentally wrong — the system is broken. These aren’t one-offs. A few tweaks aren’t going to fix it. These aren’t isolated incidents. America is being turned into a stadium where the owners charge $10 a beer because they’ve created a monopoly situation. America is being micromanaged. When we went to the moon, we went there because we decided to do it as a country, as America. We had a national goal and we figured out what was needed to do it. We can do this with any goal: Ending poverty, putting people on Mars, ensuring that all Americans receive a square deal, or even restoring democracy. Bernie Sanders is right. This isn’t going to happen by just electing one person — even him. It’s going to take everyone getting involved, understanding what we’re up against, and fighting to restore democracy. To prevent Flint from being our future, we need fundamental change and a political revolution.